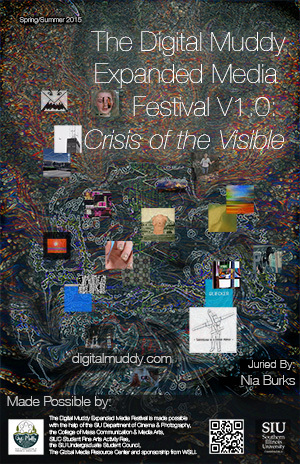 Crisis of the Visual is an expanded media exhibition curated by Nia Burks. Each of the selected works in the show explores a different avenue of issues related to expiration, trace, and temporality in artworks that exist in an environment where preservation, documentation, and relic are highly regarded within the platform of their creation. Digital space is marked by view counts, likes, photographic or physical “evidence” and other markers of audience/creator presence that display traces of an artworks occupancy in a world where their survival is constantly being threatened by shelf life, planned obsolescence, and malfunctioning technology. Crisis of the Visual aims to explore what it means to create works of electronic art whose presence is constantly plunging into the past; a space too excessive to be regimented or contained. As events disappear with the progression of time itself, a work of art enters the crisis and instability of what it means to address presence in electronic and digital art. By utilizing the processes and concepts of signal manipulation, compression artifacting, memory, digital floaters and depth, RGB spectrums, object lust, entertainment, and movement, the artworks shown engage in a discussion about the promises and failures of the absolute.